This TO&A conference suite is located in beautiful Newport Beach just a few minutes away from the John Wayne Airport and also the 405, 73 and 55 freeways. 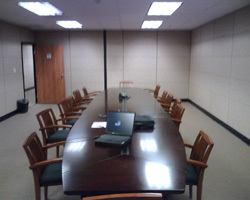 We have excellent facilities perfect for your next deposition. Our rooms can accommodate up to 12 people. Our well-furnished deposition suites provide state of the art audio/visual technology and our friendly and professional staff is on hand to handle all your litigation needs. TO&A can provide all your deposition needs from court reporters, interpreting, and videography.